The Travel Corporation staffers are clearly fleet of feet. 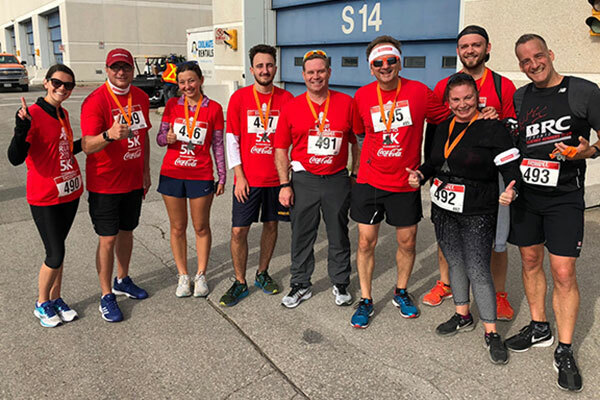 The company turned out in force Saturday for Toronto’s Runway Run, a 5K running race which has competitors run 2.5 kms along a runway and then back at Pearson International Airport. The runway is temporarily set aside for the event, which draws thousands of entrants. Seen here sporting their finisher medals after the event are The Travel Corporation’s Emily Bailey and Jason Stremble; Natalia and Adam Paunic; and The Travel Corporation’s Jeff Element, Wolf Paunic, Liam O’Donovan and Anita Emilio, and Flight Centre’s Dave Emilio. The annual event drew numerous other tourism industry figures as well.